The Houston Texans gave the Dallas Cowboys a football scare this year, enough so as to flood I-45 with incoming traffic early Sunday morning and then late when Dallas headed back home. The northern invaders headed for the Tailgate parties at Reliant Stadium at the break of dawn. This year, the Texas I-45 champions were not who we had hoped them to be. Yes, those of us living in The Woodlands had to drive amongst those blue shirts as they fluttered their flags outside of their fluttering truck windows, with BBQ pits in back and plenty of beer in the ice chests. It was an invasion! Not every fan liked the idea. Yep! It was time for the national championship! 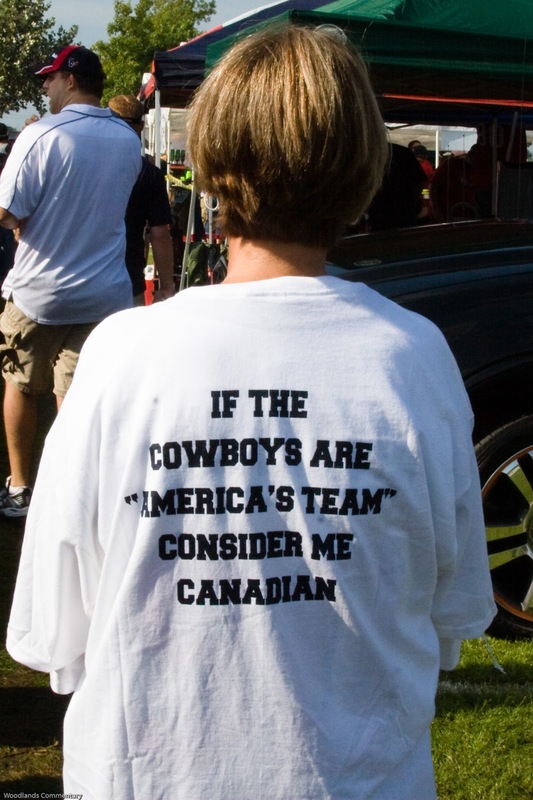 And if you are thinking USA national championship, you aint Texan! War it is! I am the 12th man! Dallas fans will soon see!! The Texans are well known for their tailgate parties. The spirit and pride of this year's Texans accomplishments so early are at the forefront now as the season begins to move seriously ahead. 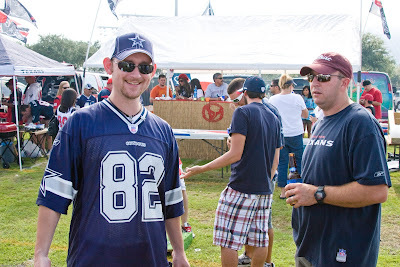 So Dallas came here to check us out and participate with us in tailgating. One fellow told me he left Dallas at 3AM. Now his mission was to show off their tailgating skills. Say what? 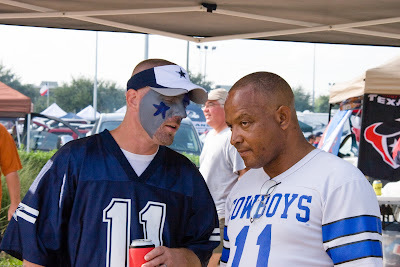 Some say these folks got kicked out of Dallas and were told never to come back if they didn't get the win. Now you can figure out the rest. Hahahaha.... responds this Dallas fan. Say what? You're not so big as ya think. Check the map. Dallas IS part of Texas! No painted wimp lady is going scare us! When was the last time YOU were called the national football team anyway? Ok, this young Texans fan was not exactly thrilled about this guy putting it that way, but he just laughed it off. 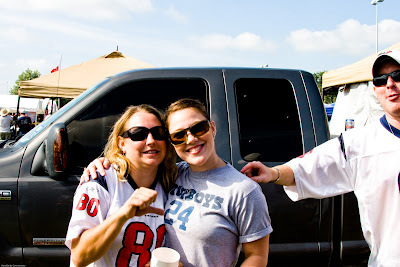 All were jesting in a very fun filled beautiful afternoon at Reliant Stadium. Truth is, we love each other. We may bash each others faces inside the stadium, but it all boils down to love in our state. Who loves the other the most? Isn't that the true contest? What you say??? Don't nobody fool ya! When ya hear someone growling, he's about to bite, not love ya. Don't stick your fingers in his mouth or you'll bring nubs right back out. 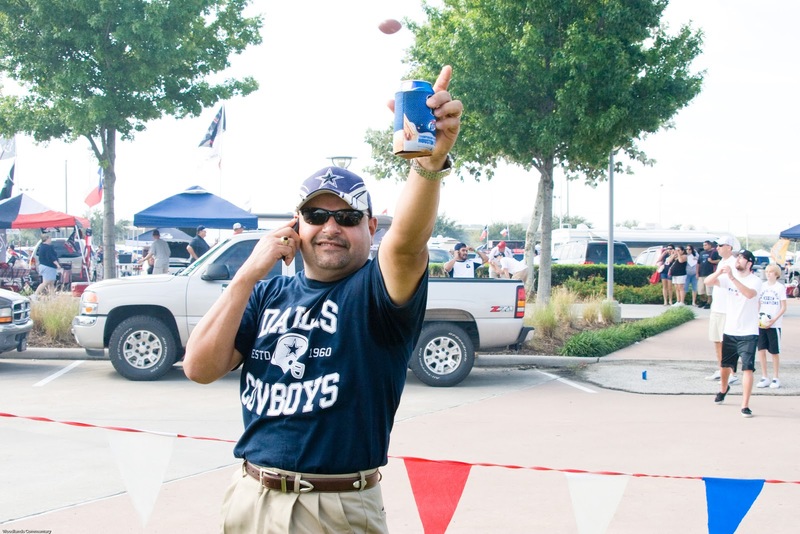 I want to demonstrate the way you throw a pass, Dallas style. They work hard teaching us this, so don't laugh. Plunk! ...I promise, we didn't laugh. We just asked a couple of questions: (1) Do they teach ya to throw the ball down or up? I'm sorta guessing, but don't want to offend ya until we get inside the stadium. (2) Is the beer making you do that or did they teach ya to throw only with the fingers? OK, good job.... considering. Well,we were just wondering ... didn't mean to be mean about it! 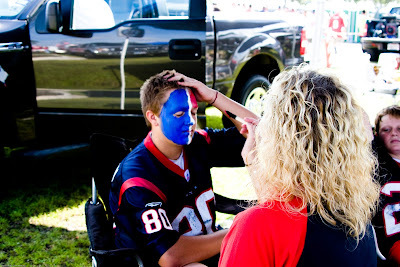 After all, that Dallas guy down there said we were wimps for painting our faces, but I didn't call YOU nothing! (An oops!) ... response: You got me wrong mister. I am Texan through and through. This is just my demo of the Dallas QB - you know, what's his name again? Seems like no one can ever remember it. ... OK sweetie, Gotcha. I'm hav'n the same problem. It just seems that almost everybody here is a Dallas fan. It was gett'n to me. You go route for our team and keep that demo going! Watch out behind you linebacker! Hey look this way at me! I got a million dollar deal going here on this phone but gonna stop and tell you Texans what I think about all this. You are doomed. We got your number! Say what? ...Yeah buddy, you sure are. You must be a Dallas LINEBACKER cause there's a ball coming your way behind ya and you have no idea where it is! Glad you are using a Miller Light chiller for your beer since it says "Texans" on it. Good advertisement for our team though. Is that the number you are talking about? I'd get back to your deal if I were you. Chances are, it will be the only good thing to happen to you today. Tell ya what, since you look like such a good guy with that blue shirt on, I will tell you a little secret to save you from doing something you might regret later. We Texans paint our faces because we are warriors. It just makes our team raging mad when you make fun of 'em. 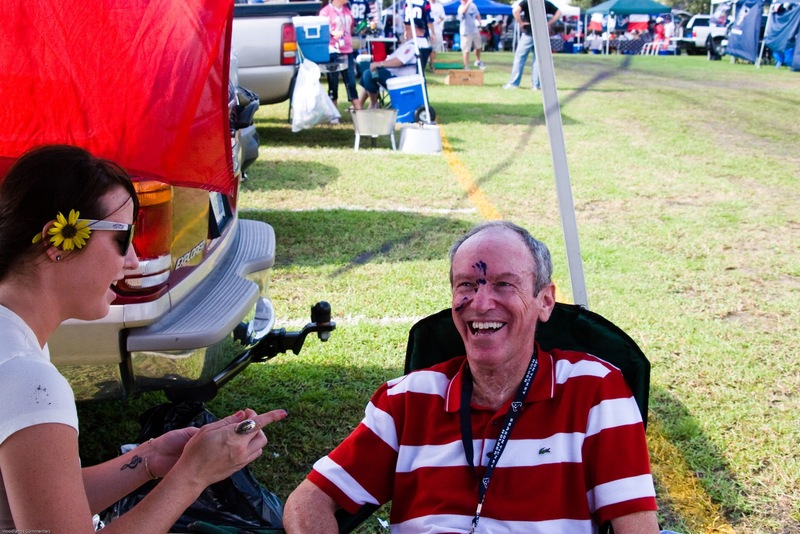 Now one of your buddies is in our camp back there telling folks that those who paint their faces are wimps. I'm about to tell our front defensive line about it. They eat raw meat when they hear stories like that. Personally, I can't tell if the meat is from some wild animal or what. I'll just point you out to them when you enter the stadium if you want to insult me. Think about it. Seriously mister, you think we will be in trouble in any way whatsoever if the game goes one way or the other? ... Sweethearts, I can certainly see your point. I think we will just move on and give that one to you! By the way, good luck (as if YOU need it). Hot! Well I thought war paint would be a good idea - not wimpy! So yours truly decided to get his face done up. Yep. Give me my war paint! I have to say it didn't seem to be getting started very well, a glob here and a glob there, but I ended all painted up and on scoreboard TV during the game. I scared them out of their chairs! That's probably why they won the game! Anybody get a photo of me in war paint? I don't think I want to show it off, because I 'm afraid the other teams we face may win just seeing it! Thanks anyway Miss makeup artist! Go Texans!! Hope to see your painted face on the TV screen next game. Come see me at the next tailgating party. Footnote: there are several people looking for their photographs to show up here. There are more stories coming in the next few days. You will be here, even if you are a Dallas fan! Woodlands folks - just next door to our hometown is a whole lot of weekend fun. 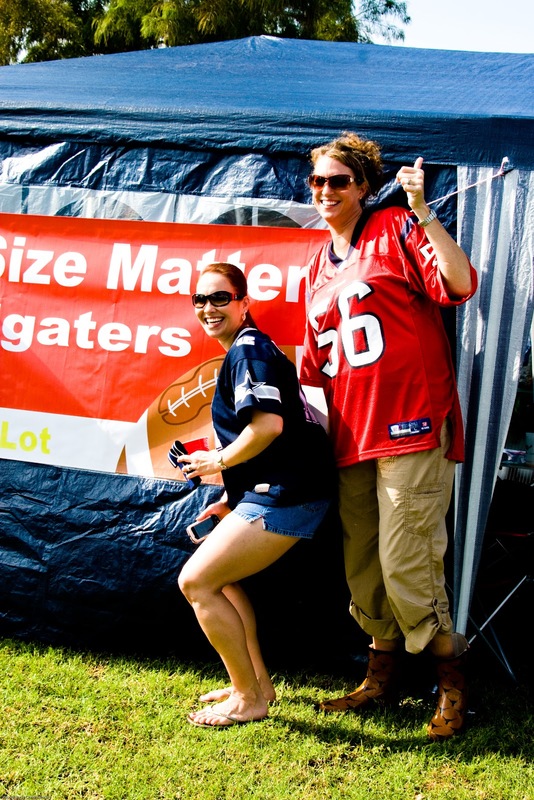 There is just nothing to compare to a professional football experience with tailgating. I am sharing some of these experiences. All 90,000 of us cannot fit into the stadium though.